The wedding from hell embroils a bookkeeper with a talent for solving puzzles in several murder cases. Phee Kimball moved from Minnesota to Arizona to help a friend, retired police officer Nate Williams, launch his private investigation firm. It’s a plus, more or less, that her mother lives nearby in Sun City West along with the eclectic, not to say nutty, group of friends who involved Phee in crime-solving (Booked 4 Murder, 2017). Now Phee’s been roped into helping plan her Aunt Ina’s wedding to wealthy Louis Melinsky, a thrice-married man of mystery. The wedding is slated to be celebrated at sunrise in Petroglyph Plaza in a state park in the White Tank Mountains. Louis has agreed to have it catered by Saveur de Evangeline, a fancy French restaurant, with sweets provided by La Petite Pâtisserie. Unfortunately, the temperamental chefs from the two establishments don’t agree on anything but their shared hatred for Felton’s, the company providing the tents. When Phee meets Jake Felton to determine where to place the tents, they discover the body of Chef Roland, who was recently on the cover of a magazine featuring the same extravagant, sweet-filled pastry birds that Chef Julien is planning for the wedding. Phee can’t count on her boss, who’s busy helping the police in their investigation into the murder of Theodore Sizemore on a golf course not far from her mother’s home. So, she’s frantically juggling all the wedding problems herself when news comes that the bridegroom has vanished and is suspected of killing Sizemore. As Nate and Phee search for clues, the murders turn out to be connected. 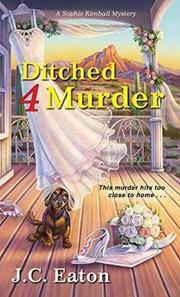 If they’re not solved quickly, Phee fears for the wedding and Aunt Ina’s sanity. A hoot. Scads of loony characters make up for a so-so mystery.